Drive train with standard cogs on right side and multiplier drive on left. 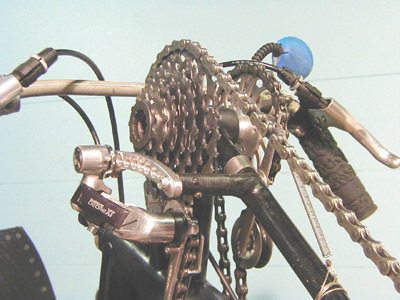 Multiplier allows the use of standard chain rings and bike parts. But more important, a split system helps move the derailleur towards the center line of the bike, away from interfering with the knee. Moved drive in front of the head tube, rather than behind, as is customary. The drive assembly can be lower because the derailleur is further forward, clearing the knee. I also push the derailleur further forward (about 0.5”) than Shimano’s normal recommended physical dimension. The parallelogram no longer travels exactly parallel to the cogs, so the jockey wheel moves further away from the smaller cogs. This doesn’t seriously affect the shifting speed (partially because of the short 6” shifter cable). The advantage is this drive system can be lower, which reflects in lowering the handlebars, and because the rider can see over this system the seat can be leaned further back, reducing frontal area. This shows the height comparison between my first FWD and the LFWD (note the FWD has 17” Moulton vs 406mm [20”] wheels on the LFWD). This lowering affects the streamliner height (seeing over the top) and gives a lower CdA as an unfaired bike. I offset the fork to clear drive chain. The fork blade is from a women’s upright bike. 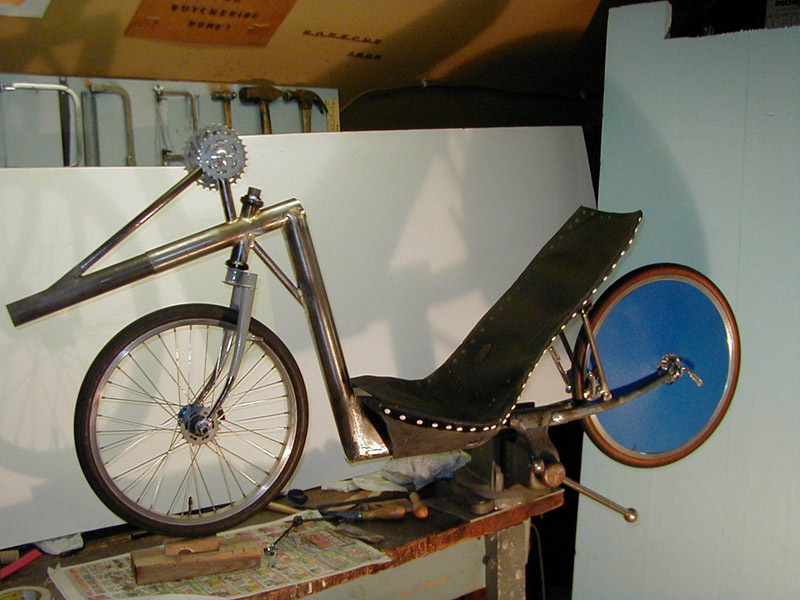 The crown is two sheets of 4130 steel brazed to a mountain bike steering tube; a mountain bike fork is used for the rear end. Because there is about a 6 degree angle between the drive chain and head tube, there is some torque steer when starting and when climbing at low speeds and high outputs. You get used to it and make micro adjustments in the handlebars automatically. This torque goes away above 5 mph. The advantages far outweigh the disadvantages. 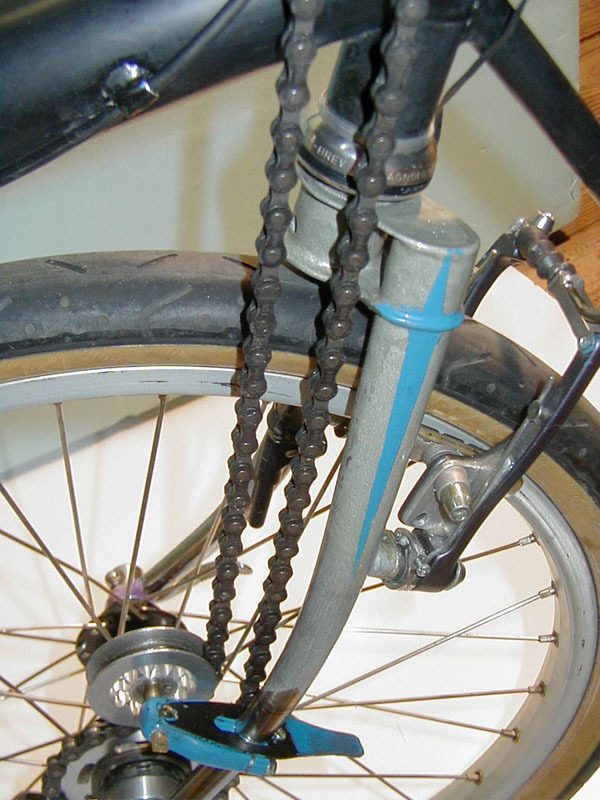 Some FWDs put the derailleur down on the drive wheel (right side). 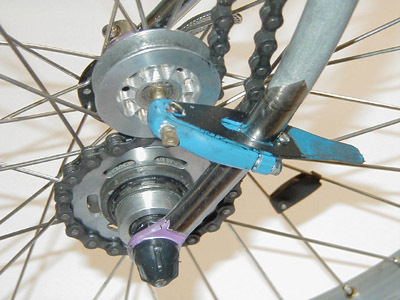 Two problems: the hub is wider to accommodate the cogs, and the parallelogram of the derailleur sticks out just where the rider’s foot would travel as it goes to the ground. 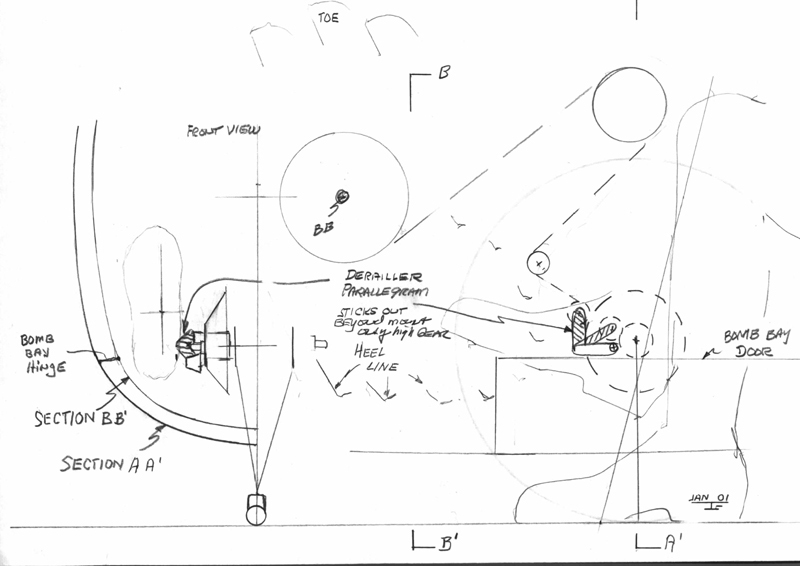 There isn’t enough room between that parallelogram and the sides of a streamliner through a bomb bay door. This shows front and side views of this interference. Works fine for an unfaired bike. Having a split drive system requires a left hand drive freewheel. I modified a standard Shimano freewheel to work on the left side. 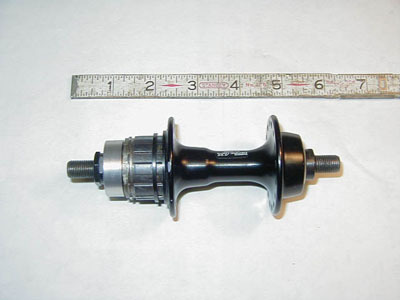 This modified freewheel narrows the width of the hub 144mm between dropouts, giving a bit more clearance for the feet. Because I needed an idler to guide the chain on to the cog (Rule: Chains going on to cogs need an idler or guide), I added a two-speed fork shifter that can be easily reached under the left leg (on a low-seated bike). This is used only when climbing steep hills. See carbon mesh seat construction section. This seat has mesh for breathing with air intake and outlet, and is very light, 1 lb. 6 oz., yet quite stiff, so I can get lots of power into the bike. Under load the lumbar area of rider is against the seat, not suspended by the mesh. Between the stiff seat and small wheels (406mm / 20”) the bike jumps. Low seat so the rider is in the turbulent shadow of the bike, which reduces total frontal area. Yet the seating position is fairly upright, which I feel is important for quick handling, particularly when riding in traffic, to allow easy head motion to see. A carbon boom is glued to the inside of a 1.75” (outer diameter) short steel boom. There also is a smaller carbon tube brace going from the end of the boom to the upper cogs that stiffens the boom. Slipped inside the main carbon boom is another short carbon tube with the bottom bracket that allows bottom bracket front/back adjustment. Carbon helps reduce the front end weight that some FWD’s suffer from. 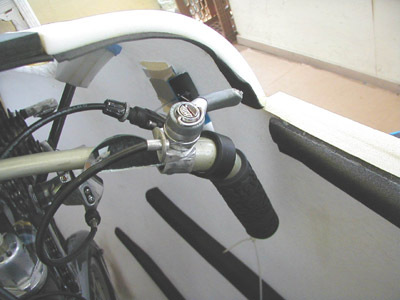 The bike frame consists of 2” 4130 down tube 0.035” wall, 1.75” bottom tube 0.035” wall, and 1.75” short boom. The total bike weight is 24 lbs. 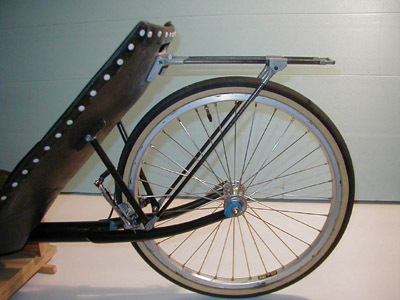 without fenders, with a 42” wheel base. 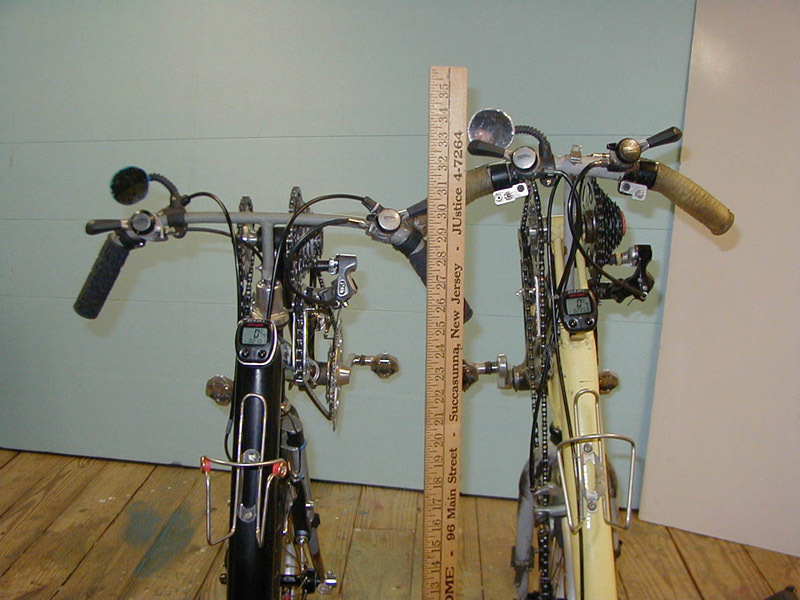 A mountain bike fork was used for the rear fork. There is partial suspension due to fork flexing because the brace is not located at the end. That brace is also located at the high rider pressure area on the seat. The carbon luggage rack is made from 0.25” diameter commercial carbon tubes. The U-shape steel tube is glued at the end of the two main tubes. Flattened steel tube ends are also glued to the carbon tubes. The two sheets of carbon across the two main tubes do a wonderful job of stiffening the assembly (slots cut for pannier clips). The rack is narrow (2” wide) so panniers can fit inside a streamliner and won’t stick out in the air stream when running unfaired. Weighs around 6 oz. 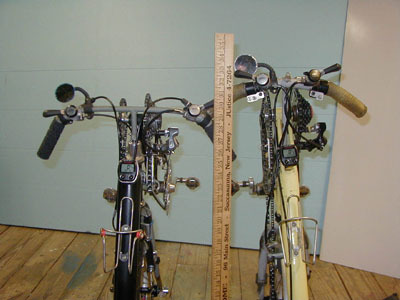 Small diameter tube handlebars. No need to make them fat until the ends for the brakes, shifters, and hands. Direct steering  no tiller. 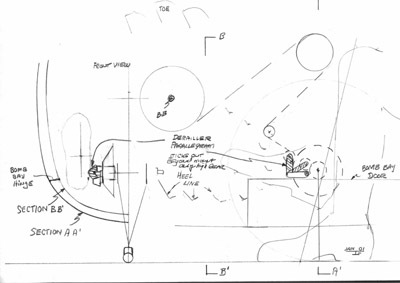 It’s easy to make micro adjustments with the fingers, which is important in a streamliner in the wind. Arms out straight reduce drag when unfaired. The unfaired CdA is around 2.3 sq. ft. The width of the bars (and hands) force a slightly wider streamliner shell, but this width happens to be near the normal maximum width for a turbulent bodied streamliner. Bar-end shifters were converted to thumb shifters. Note the 6” shifter cable to the derailleur. These are the quickest, most positive, and easiest to use shifters out there. I’m buying spares in case Shimano quits making them. Mounts were formed from aluminum and soldered with aluminum solder. They are lighter than Shimano mounts. When inside a streamliner, I can feel the angle of the shifter to tell me what gear I’m in. Unfaired, I can see the gears (they are enjoyable to watch). Disadvantage: the thumb bar sticks up in the lower gears so that the streamliner shell has to be raised a bit to clear it. Not a big problem in exchange for crisp shifting.